An artist's impression of HD 189733b and its star. Though scientists have yet to find alien life on distantexoplanets, much about those planets certainly seems alien ? especially theweather. Now researchers have developed a model that can explain someof the bizarre weather patterns seen on otherworlds. 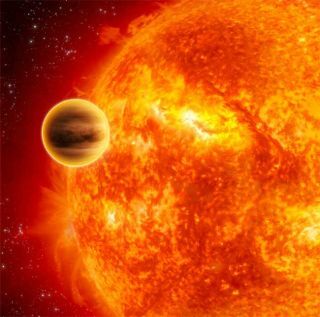 Many of the roughly 300extrasolar planets discovered so far are called "hotJupiters" because they are large gas giants like our own Jupiter.Often, these planets orbit much closer to their stars than Jupiter does to thesun, so their daylight temperatures can reach 3,000degrees Fahrenheit (1,600 degrees Celsius) ? much hotter than any planetin our solar system. While many extrasolar planets aretoo far away to detect anything at all about their weather, for a few planetsscientists have been able to infer temperature changes from the varyingbrightness of the planet as it rotates relative to the Earth. On one such planet, called HD189733b, Spitzer Space Telescope observations showed the night-side temperatureexceeds 1,300 Fahrenheit, which is much warmer than scientists expected. Because many exoplanets orbit soclose in to their stars, scientists think they are often "tidallylocked," or trapped in position with one side permanently facing thestar's light and the other side in perpetual nighttime. Somehow, heat getstransported from the daytime to the nighttime side of the planets, though howthis happens has not been understood. Now a new model created by AdamShowman of the University of Arizona and his team finally explains theprocesses creating the exotic weather patterns seen on exoplanets. "Our model I think isthe most realistic in the sense that it includes not only the weather processesin the atmosphere but couples them to how heat is absorbed and lost,"Showman told SPACE.com. "We created a pretty good representationthat matches the observations." The researchers found thatfast-moving jet streams could carry warm air from the sunny side to the darkside of a planet. To account for the temperatures measured on planets such asHD 189733b, these streams would have to be speeding along at 7,000 mph (11,000kph). "You're talking about windsfast enough to carry you in a hot air balloon from San Francisco to New York in25 minutes," Showman said. While jet streams occur on planetsin our solar system, including Jupiter and Earth, the streams are generallysmaller and slower-moving than what's not being suggested for exoplanets. "The basic chemical and physical processes are similar,but all the details are different," Showman said. "These planets areso close to their stars, so their temperatures are much higher and winds speedsare much higher. These types of jet streams are something that doesn?t exist inour solar system." While the strange weather patternson some exoplanets would certainly be fascinating to see up close, theywouldn't be very hospitableto life like us. "Hot Jupiters are prettycrazy places," Showman said. "Expect supersonic winds anddayside temperatures hot enough to melt lead and rocks. Only problem is, if youtried to visit, you'd be fried to a crisp before you could enjoy theview."